On Monday the BFS Girls Varsity Softball Team defeated Bay Ridge Prep 16-5 in the ISAL Semifinals at Van Voorhies. The team got off the bus and the clouds rolled in. The weather wasn’t looking good. After a short period of rain the sun came back out. BFS took the field and was ready to play. Junior pitcher Taty R. got off to a slow start as she arrived only a couple minutes before she had to throw her first pitch (she stayed back at school to review for an upcoming exam). BRP capitalized as Taty walked their first two batters and BRP scored two first inning runs. Senior Maret S-M made a great play on a grounder in the whole to end the inning and get BFS up to the plate. Maret then led off the game with a walk, followed by a RBI single by Taty. Senior clean up hitter Julia B. then launched a two run home run to give BFS the 3-2 lead after one inning of play. Taty settled in and retired BRP in order during the top half of the second inning. BFS picked up one more run during the bottom half of the inning as senior Aireankhue O. smacked a nice double and fellow senior Greta L. drove her home on an infield out. BRP was into the game and Taty gave up a lead off walk. She struckout the next batter, but then gave up a single followed by another walk. BRP’s three hitter stepped in an blasted a shot over our leftfielders (Greta) head for a three run home to give BRP lead again.Our opponent was fired up and we need to get back into the game. Julia B. started off the bottom of the third inning with a nice single, followed by a single from sophomore Ivy L., then a walk by senior Julia C., then a RBI single by senior Areil G. Maret and Taty came up with big two out RBI singles and BFS plated six runs to jump back in front (10-5) and grab the momentum. Taty cruised through the next two innings and BFS scored three more runs during the bottom of the fourth and then three more during the bottom of the fifth inning. Taty closed things out during that bottom of the fifth inning with a three run home run down the left field line. SHe finished the game with 5 RBI’s. BFS took care of business and lined up to shake hands as they once agin found themselves heading to the ISAL Finals Game. The team is heading to its fourth ISAL Championship Game in a row. Congrats to all the players and coaches, especially the seniors (Julia B., Julia C., Ariel, Airenakhe, Greta, and Maret). Thanks to all the fans who come out to the field to support the team and the program. Blue Pride!! The BFS MS Boys Baseball Team defeated UNIS 11-7 down at Red Hook. The team came from behind to pull out the victory. Seventh grader Gabe D. pitched four innings, striking out six batters. He showed toughness on the mound pitching out of a few jams with runners in scoring position. Fellow seventh graders Jack B. and Finn S. helped close out the game from the mound. On the offensive side, seventh graders Lewis W. and Ryan B-H had two RBI’s a piece. 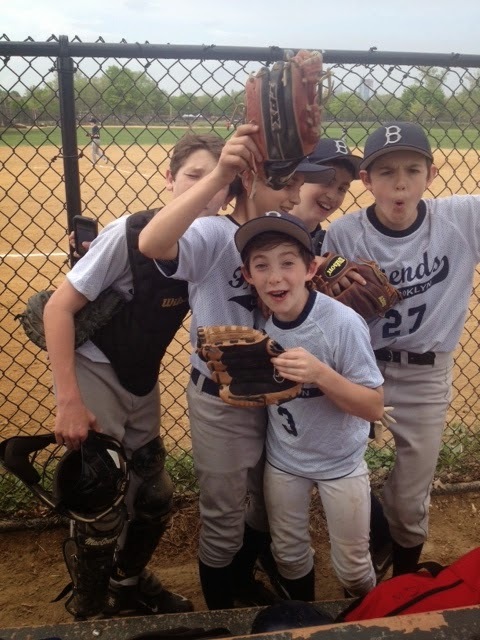 Finn S., Ty S., Jack B., and Gabe D. all contributed with an RBI. This win ensures the middle school baseball team will have a winning record this season. BLUE PRIDE! On Tuesday the BFS MS Boys Baseball Team defeated Packer 9-4 down at Red Hook. the team rode the 11 strikeouts of seventh grader Jack B. and some timely team hitting to secure the season ending 9-4 victory over their local rival. Eighth grader Patrick D. got BFS on the board with an RBI single and seventh grader Aja M. led the offense with a 2-run home run, his fourth home run in as many games. Seventh graders Finn S. added a triple and Ty S. knocked a pair of singles to help the offensive attack. The team finished the season with an impressive 7-3 record and has bright future ahead returning ten of eleven players. Thanks to all the players, coaches, and team managers. Coach John Hay received the game balls and water cooler dumping as it was his last game coaching at BFS. He will truly be missed. Thanks for all the great memories coach. BLUE PRIDE!! On Wednesday the BFS Girls Varsity Softball Team defeated LREI 6-3 in the ISAL Finals at Randall’s Island. It was one of the best games ever. We are the Champions. 2015 ISAL League and Playoff Champions (undefeated). The whole team showed up and was ready for action. BFS waited for all its players to finished their exams before heading up to Randall’s Island for the big game. The team was focused and zoned in. Having six seniors out of fifteen total players (five of whom have played for four years) really helps. These girls and this team had been here before. This was the team’s fourth straight championship game appearance, and the third against the same opponent, LREI. The Panthers came close last year, losing 5-2 in a well-played finals game at Van Voorhies. Both pitchers returned as juniors in this year’s final game. BFS pitcher Taty R. saved her best for last. She was on point. Taty controlled the game with a little help from her “Friends”. Both teams managed to get out of trouble during the first inning of play. Taty struck out the first batter she faced and you could tell she was zoned in– it was going to be a special day, but how special we did not know at the time. Then she gave up a hit. The LREI hitter then stole second. The next batter (LREI’s best player) hit a pop up that was headed behind shortstop – but senior shortstop Ariel G. went back and snagged. Then Taty gave up another hit but BFS was able to hold the runner. With two outs and two, LREI hit a grounder to third and our third base woman, senior Julia B. calmly made the play and fired it over to sophomore first base woman Ivy L. for the final out of the inning. BFS came up to bat for the first time. The first year we faced this pitcher we had trouble putting the bat on the ball, but now we know we can hit her. Senior Maret started the game off battling and hit a grounder back to the mound for an out. Taty was hit by a pitch and then stole second and third. Sophomore Silvely A. popped out to the catcher for the second out. With Taty still on third, BFS clean-up hitter Julia B. popped out to first base. After one inning of play it was 0-0. It was much of the same during the second inning as Taty retired LREI one, two, three (on 10 pitches). Then BFS was also retired one, two, three, but continued to make contact. Taty then struck out the side during the top of the third inning. She really had it going on the hill. And this is where the game changed. BFS sent up senior Airenakhue O. and she delivered. She hit a grounder down to third and beat out the throw for and infield single. She then stole second and third. Fellow senior Greta L., who just joined the team this season also came through with an important infield single scoring Airenakhue. BFS was on the board. Senior Maret S-M came through as she has all season with an RBI single to give BFS the 2-0 lead after three innings of play. Taty retired the first LREI batter during the top of the fourth before walking their best player who then stole second, third, and eventually home for LREI’s first run of the game. Taty closed out the inning with a strikeout. BFS threatened again during the bottom of the fourth inning but came up a bit short. Taty continued grooving and retired LREI in order, picking up to more strikeouts. Then came the bottom of the fifth. This time it was senior Ariel’s turn two start things up for BFS. She led off with a very important walk. Then Aireankhue once again came through with a sweet single. After a BFS strikeout junior Naya C. was hit by a pitch and BFS had the bases loaded with one out. Maret came through again as she lashed a single over the shortstop’s head driving in Ariel. Then Taty helped herself by bouncing out and driving in a run. BFS wasn’t done as Silvely calmly stepped in and stepped up with a fly ball double down the rightfield line to drive in two more BFS runs. BFS now had a 6-1 lead going into the sixth inning. Taty struck out the first batter then gave up a single and then struck out the next batter. So there were two outs and one with LREI’s best player stepping to the plate. Taty battled but LREI’s three-hitter came up with an RBI single. She then stole second,third, and home again. Taty had to bear down against LREI’ clean up hitter. She battled and the player hit line drive to shortstop, Ariel got a glove on it, but the ball trickled out, rolled down her body, but ended up stuck basically under her arm pit. Wow, the inning was over and Ariel came through once again. BFS went down one, two, three during the bottom half of the sixth inning. So BFS was taking the 6-3 lead into the top of the final inning. The fans were on their feet. Taty just needed to continue to throw strikes and get some help from her “Friends”. LREI sent up their fifth hitter, who singled. Now LREI’s team was up on their feet, along with their fans. BFS just needed one out at a time. The next batter hit a liner back to Taty, who fielded it and threw to Ivy at first for the double play. Wow! BFS just needed one more out. LREI hit a grounder to short and Ariel knocked it down. From her knees, she fired the ball over to first, just missing getting the runner. LREI had a little more hope. BFS just needed one more out. The next ball was hit to Julia B. at third who grabbed it out of the air and recorded the final out of this great championship game. We are the CHAMPIONS my FRIEND. Congrats to all the players, coaches, team manager junior Sierra Vines. Thanks to our wonderful seniors – Julia B., Julia C., Ariel G. (game ball), Airenakhue O. (game ball), Maret S-M, and Greta L. Thanks to our juniors Taty R. (who pitched the complete game 95 pitch 9 struckout victory – game ball), Naya C., and Sarah G. Thanks to our sophomores Ivy L., Silvely A., Sophie E., Anna W., and Fiona B. And thanks goes out to our only freshwoman Rosemary D-C. Thanks to all the fans who came out during this memorable season. Blue Pride!! Blue Pride Runs Deep, Friends Forever!! The BFS Boys & Girls Varsity Outdoor Track Team participated in the ISAL Championship Meet down at Red Hook. It was a beautiful day to compete. Thanks to everyone who participated. The team of all first year competitors gave it their all down at the track. Sophomore Malik D. competed in the 100M race which had 6 heats. The first place in each heat advanced to the finals. He ran the race in a time of 13.62. Due to a strain he was unable to compete later in the 400M race. Coach showed him some self myofacial release techniques and he was better towards the end of the meet. Freshman Miranda C. and sophomore Monet M. competed in the girls 800M race and took 7th and 8th place respectively out of a field of 12 total runners. Miranda improved her placing from last week and had a great race. Monet continues to improve and is learning about pacing. Fellow sophomore Ben F. ran the 400M race today and was 4th of 6 in his heat out of a field of 18 total runners. Sophomore Sam F. ran the 200M race today which had 27 participants. It was a great ending to the season….Blue Pride!! 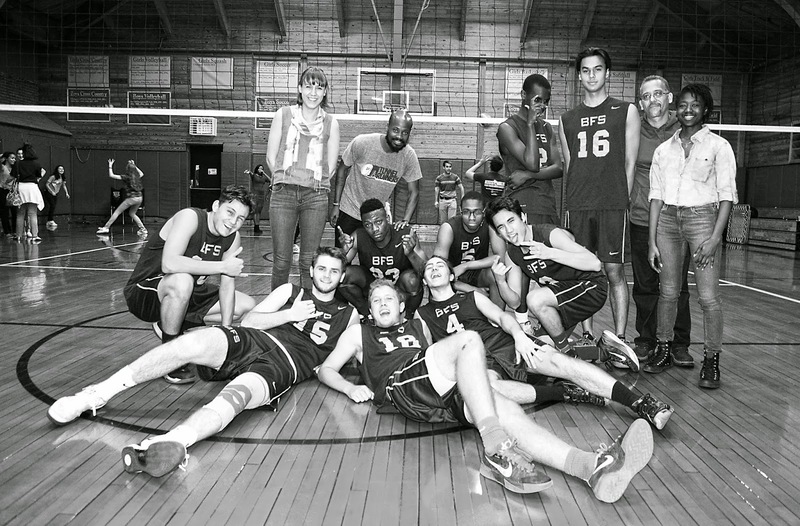 The BFS Boys Varsity Volleyball Team took the court for the last time this season before their playoff run. They took on Brandeis from the public school league in a scrimmage on the road. Even though it was a scrimmage, the team took it very seriously and played a very intense match. Brandeis has a rich and long history of competitive volleyball. Our team continued representing BFS, showing our pride and strong mindset. Although the match was competitive, we dominated the pace and came out on top 3-0 (25-11,25-21,25-20). This match continued building on the teams amazing season. Everyone contributed to the victory. It was a great learning experience in preparation for the ACIS playoffs next week. See you Monday at St. Francis College at 4:30pm for the Teams Semifinal Match Up.